As Canada’s premier ski destination, Whistler Blackcomb offers tons of adrenaline-fueled activities with just enough risk to capture your teens’ attention but plenty of built-in safety precautions to give you peace of mind. Some of these activities are one-of-a-kind and can only be experienced at Whistler Blackcomb. Here's our picks for the top 6 activities for teens. Note: All prices are listed in American dollars but will vary given the exchange rate with the Canadian dollar. With the most skiable acres of any other resort on the continent, your teens will have more runs to ski and ride than they possibility could fit into one ski vacation. Even if they are beginners, they won’t be limited to the bunny hill; at Whistler, you can ski green trails from the top of the mountain. If they’re looking to develop their skills, sign them up for a private lessons or group lessons. In addition to ski and boarding lessons, they also can learn freestyle. Cost: Varies. KidTripster Tip: Avoid paying full price on site by pre-purchasing your lift tickets online at least three days in advance. Online 2-day lift cost: Youth (13-18) starts at $124; Adult starts at $147; during peak season, lift ticket prices increase. Here’s one for your teen’s bucket list: bobsleighing (or bobsledding) down the world’s fastest track at the Whistler Sliding Centre. Our family did the heart-pounding, “Thunder on Ice” experience together. There was a moment during the safety orientation where I thought to myself, “I must be crazy to let me kids do this,” but it's truly safe. The four-person bobsleigh is piloted by a professional, and you start seated in the sled rather than running and then jumping inside. You also start two-thirds of the way down the Olympic track rather than the top. That being said, this ride isn’t for the faint of heart. You need to be at least 14 years old (you’ll need to prove your age with a passport) and be physically strong enough to brace yourself in the sled, so that your head doesn’t bang from side to side. You’ll reach speeds up to 77mph! And there’s a moment toward the end of the ride where you’ll experience the pressure of 3Gs against your body, but it only lasts a few seconds. My sons, 14 and 16 years old, give the ride two thumbs up! Cost: $132/person/ride; reserve in advance. Watch the video here, courtesy of Coast Mountain Photography. Need an even bigger rush? The Whistler Sliding Centre is the only place in Canada where the public (16 and up) can experience the sport of skeleton. Here your teenager lies face-first on a sled going up to 62 mph around six corners with his chin just inches off the ice as part of the “Lightning on Ice” experience. Believe it or not, the activity doesn’t require any previous experience, and the instructors insist that it’s even safer than bobsleigh. Cost: $132/person/ride/two slides; reserve in advance. Feel the wind in your face as you cruise down the tubing hill, located in the Base 2 Zone on Blackcomb Mountain. 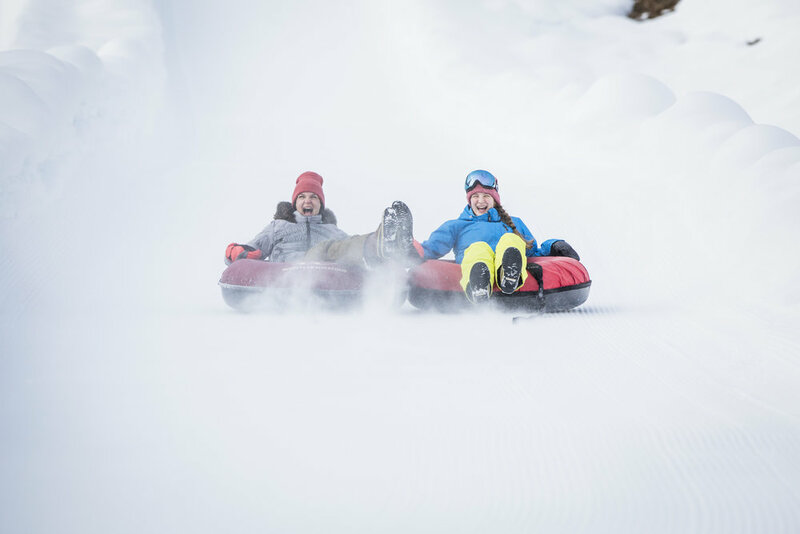 While only one rider is allowed in each tube, teens can link up with their friends and tube as a group down the hill, weather permitting. Cost: Youth (13-18) $21/hour; Adult $23/hour; discounts for second hour; tubes are provided. KidTripster Tip: If you’re headed to Whistler Olympic Park, you can go tobogganing for a lot less money. Cost: $15 per vehicle. Sleds and helmets provided; helmets required for all sledders, ages 18 and under. If your kids are at least 19 years old, consider taking a guided snowmobile tour through the Callaghan Valley with Canadian Wilderness Adventures. For insurance purposes, you need to be at least 19 years old to drive a snowmobile on these tours. And frankly, driving is what makes these tours fun! I’d recommend a daytime tour over an evening one; temperatures really drop at night. Dress for the conditions with the warmest fingered gloves that you can find. Callaghan Cruiser cost: Single driver $117; Sharing rider $88; Youth (under 12) Free with a paying adult. It’s the least expensive thing to do with teens in Whistler: ice skating at Olympic Plaza. Because there’s no night skiing or boarding, I’d reserve this activity for the evening. Follow up your skate with a cup of hot chocolate with extra whip cream! Cost: Free; Skate rental $6. To read a full review of Whistler Blackcomb, click here. Visiting during the holidays? Click here. Editor Shellie Bailey-Shah travels with her husband and their fearless 14- and 16-year old sons. The youngest is already asking to do skeleton on the family’s next trip to Whistler. Shellie won’t be joining him!